Dore abbey was established in the Golden Valley of south-west Hereford in 1147 and was colonised by monks from Morimond Abbey in the Champagne region of north-eastern France. 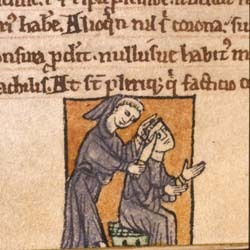 (1) When the monks arrived from Morimond they found themselves on the border lordship of Ewyas Harold, owned by Robert fitz Harold of Ewyas, who became the first patron of Dore. Dore was the only British house to be colonised by Morimond, although in turn it was to send out three colonies of its own: Trawscoed (in Wales, 1173), although this house was aborted in the early years of the thirteenth century and the site was subsequently worked as a grange, Grace Dieu (1226) and Darnhall (1274) which later moved to Vale Royal. (2) Apart from the estates in the Golden Valley, Dore abbey was to acquire a number of valuable properties in Wales. Gerald of Wales claimed that Abbot Adam I (c. 1186  1216) was a devious individual intent on acquiring property by any means, fair or foul. He also believed that the monks of Dore carried off humbler folk from nearby villages who were dying and by corrupt persuasion wheeled them to their abbeys and then took their possessions. During the first half of the fourteenth century the abbey was headed by a rather more respectable character, Richard Straddell (d. 1346). Abbot Richard was a distinguished scholar and theologian and at times served as a diplomat for both the crown and the Cistercian General Chapter. (3) In 1321 he was given a relic of the Holy Cross by William de Gradisson, and it was said that crowds visited the abbey to see this. Lady Matilda de Bohuns tomb (1318) was also a focal point of the abbey as it was thought to have had the power of healing.